Originally started in 1983 under the name of Mr. Gay All-American, the contest was brought back as Mr. Gay America in 2017. In 1995, Jones sold the Mr. Gay All-American Contest to Gib Hauersperger, who had been the contest director since the death of Carmel Santiago. Hauersperger operated the pageant until his retirement in 1999. Paul Lopez (Mr. Gay All-American 2000) operated the contest from 1999 to 2003, when Richard Greer (Mr. Gay All-American 1999) assumed the directorial role. John Beebe (Mr. Gay All-American 1996) succeeded Greer as director. In 2009, Beebe and Hauersperger announced that the Mr. Gay All-American Contest system would cease operations indefinitely. In 2016 Michael Dutzer and Rob Mansman of Mad Angel Entertainment purchased the Miss Gay America pageant. After completing their first national pageant they decided to introduce Mr. Gay America, bringing back the traditions and history of the Mr. Gay All-American contest under the direction of Antwan Lee. They will continue to honor the former titleholders as part of the America family. On July 1st, 2018 the contest was held at Hamburger Mary’s in St. Louis, Missouri. Judas Elliot won the title of Mr. Gay America 2018 and Simba Hall was First Alternate. On July 2nd, 2017 ten contestants who were decided by a first come first serve application in January competed at the Rose Room in Dallas, Texas for the title of Mr Gay America. Kyle Haggerty won the title of Mr Gay America 2017 and Judas Elliot was First Alternate. Taz Bailey from Midwest City, Oklahoma was selected from a field of three at the Copa, May 19th, 2007 in Oklahoma City in a competition based on interview, fashion modeling and talent. Rounding out the contest was Sebastian Armonte of Pittsburgh, PA, (1st Alternate,) and (2nd Alternate,) Dean Taylor of St Louis, MO. Awarded a $2,500 prize package, Bailey will represent the pageant throughout the country promoting a positive gay role model and participation in the MGAA system. The event was hosted by former MGA 2004, Rachel Eriks and MGAA 2006, Lucas Lander, which also featured guest performers and former contest winners. Moments after claiming the title of Mr. Gay All-American 1987, Medwin Johnson is congratulated by then-reigning Miss Gay America 1986, Lauren Colby. “We Are Family” – Masculine excellence gathers at the fourth annual Mr. 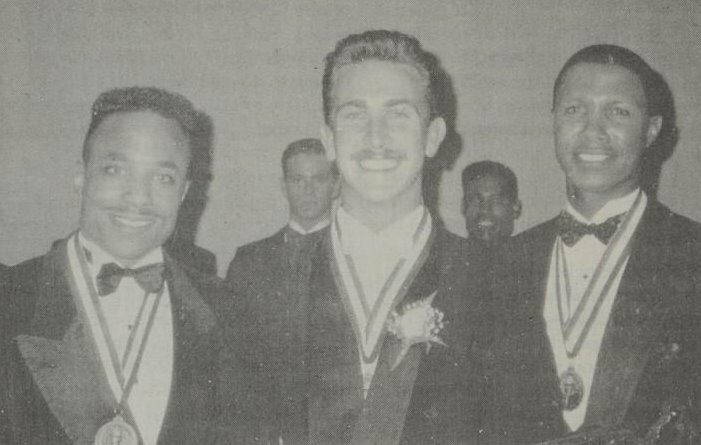 Gay All-American Contest in July 1986 at the Old Plantation in Dallas, as the first three national titleholders welcome the newest member to their brotherhood. From left: MGAA 1985 Keith Mitchell; MGAA 1986 Ered Matthew; MGAA 1987 Medwin Johnson; and MGAA 1984 Ron East. Mr. Gay All-American 1985 Keith Mitchell congratulates his successor, Mr. Gay All-American 1986 Ered Matthew.